The summer before my senior year of high school, I had been working at a plant that specialized in producing bricks. My job was to pick up bricks from a conveyer belt and stack them on pallets. My pay was based on production, so the harder I worked the more money I made. There’s a lesson in that, but it did not used to apply to my educational opportunities. No matter how hard I worked, my future opportunities and chances for higher education used to seem limited. Thanks to DACA, I was able to get a driver’s license. I was able to get decent jobs that paid well. And, most importantly, I was blessed with the opportunity to continue my education. America is my home. It is where I have grown up, where I have made all my friends, and where I go to school. America is where my family is. It is important to me that I stay in the U.S. so that I can start a career, support my parents, and give back to the community I was raised in. But I also want to remain in the U.S because it’s all I know. I came here when I was three, and don’t know anything about where I used to live. It would be the same as sending me to live in Spain, Argentina, or any other Spanish-speaking country. I would be able to speak the language, but I would be a stranger in a foreign land. My family is my rock. My father does not let our situation discourage him. He is always positive and has a “never give up” attitude — I truly admire him. My mother is tough as nails, and I strive to emulate her work-ethic. My older brother fixes garage doors, but his true passion is teaching. I always learn something new when I talk to him. If couldn’t find a scholarship to help me attend college, I was planning to work at the brick factory for a year and save money. That money would cover a year of school while I applied for more scholarships and worked part -time. Then, one day after class, my high school Spanish teacher told me about TheDream.US. It was truly the opportunity of a lifetime. For the first time, it seemed like all my studying and hard work was going to get me to where I wanted to be. From my family to professors to an old boss, I appreciate everyone who has helped me along the way. Thanks to their support and belief in me, I plan on taking the GRE next October and graduate with a Bachelor of Arts in Psychology in 2019. Afterwards, I hope to enroll in a graduate program that will prepare me for a career as an Industrial/Organizational psychologist. I plan to support the undocumented community by working diligently towards my academic success and by sharing with others information about the opportunities available for DACA recipients and undocumented students. 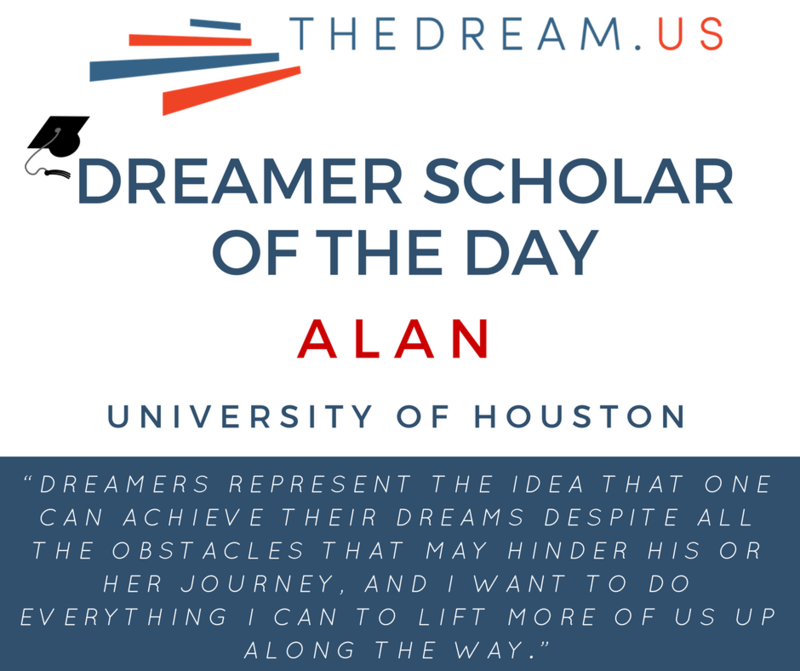 DREAMers are the foundation for a new generation of hard-working students. We represent the idea that one can achieve their dreams despite all the obstacles that may hinder his or her journey, and I want to do everything I can to lift more of us up along the way.